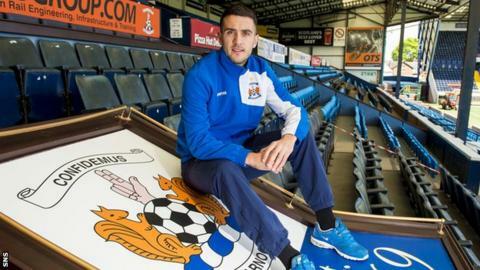 Gary Dicker is warning his team-mates they do not want to go down in history as the players who ended Kilmarnock's 23-year stay in Scotland's top flight. The Ayrshire side will be relegated from the Scottish Premiership unless they can recover from being 1-0 down to Falkirk in the play-off final. "It doesn't matter where you might end up or what you might do. "You will be remembered for this game if you don't win it, but I am sure we will win it," said midfielder Dicker. Kilmarnock are in the play-off against the side who finished runners-up in the Championship after finishing second bottom of the top tier. Will Vaulks' stoppage-time winner at Falkirk Stadium on Thursday means Dicker's side have to win at home - something they have only achieved four times in the league this season. The 29-year-old Dicker, who joined Kilmarnock in February after leaving Carlisle United, points out that football is a short career. "When you are a lot younger, you think you have loads of time, but it goes in a blink," said the Irishman formerly of Brighton, Rochdale and Crawley Town. "I think that's been the story of our season - everyone saying we have got next week. "We are lucky, we have a second chance. But we haven't got that any more. We have Sunday and that's it." Dicker believes that his side can end Falkirk's run of eight games without defeat to overturn the first-leg lead. "It is not a one-off game, so we are looking forward to Sunday," he said. "We need to embrace it and look forward to it and I don't think we have anything to fear. "We have felt sorry for ourselves sometimes and we need to learn quicker, everyone as a group. "We shouldn't be in the position, but we are. The league table doesn't lie." Kilmarnock missed several chances in the first leg before Vaulks' winner, but Dicker is having none of any hard-luck stories. "You earn your own luck in this game," he said. "You earn it by hard work and doing the right things all the time. "I have never been relegated and I don't want to be relegated. "I am sure I will be drumming that into everyone in the dressing room, even the young lads."